It has been far too long since my last entry here. Sometimes life gets in the way. Writing articles here became a very low priority. I hope that you haven’t missed me too much. In the latter half of 2017, I became the full-time carer for my wife, Corinne. She had experienced many bouts of illness in her life from when we were first married – some 47 years ago. 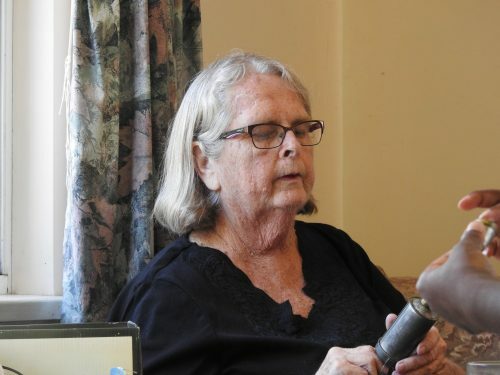 Her health deteriorated rapidly in the last few months of last year and we had many trips to the local medical centre as well as many drives to Adelaide for treatment – some 80 kilometres away (about 1 hour). We were pleased to be able to celebrate Christmas as a family; our daughter who is currently teaching in Ethiopia flew home, and our son and family drove over from Sydney (about 15 hours’ drive). It was delightful to have the grandchildren here for this special occasion. In the middle of January and after the second round of radiotherapy, my wife went downhill very rapidly. After a short stay in the local hospital, my wife passed peacefully and pain-free from this life on the 21st January 2018. She was surrounded by immediate family. Her funeral a week later was well attended by a wide range of people from many different aspects of Corinne’s life. It was a celebration of a life well lived with an impact on the lives of so many people. I have written an obituary on her website, Mallee Native Plants Nursery here. She was a keen admirer and grower of Australian native plants. Her website contains a wealth of information on our plants and how to propagate them. I will maintain this site, for the time being, adding some new articles from time to time. Her nursery has now closed down and there are no plants for sale. Her interest in our plants rubbed off on me and it complemented my interest in birds. Both of us loved sharing our flower photos and she grew to appreciate our beautiful bird life too. One of her favourite birds appears at the top of this post. 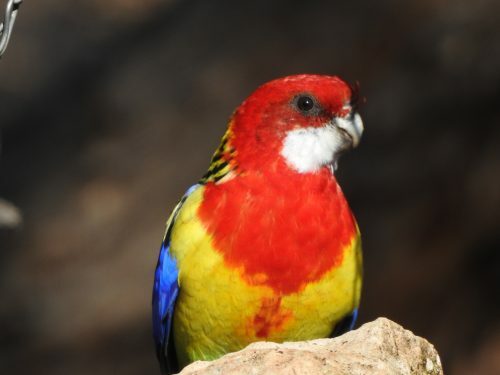 She loved seeing all the birds in our garden, including the Eastern Rosella shown above whenever one of them came to our bird bath. The photo below was taken at Christmas time in 2017. She was helping her two grandchildren to put the icing on the honey biscuits made especially for the occasion. I plan to get back into sharing my writing, book reviews and hints about the writer’s life here on this site over the coming weeks and months and – I hope – years. Last year I bought myself a new camera and this is proving to be more than I had hoped for – so expect many more photos to be shared as well. I am not yet ready to get back into travelling, but I definitely have plans to do so. In the meantime – good reading and writing. I get very annoyed when I read posts on social media which contain simple spelling errors. Don’t these people ever CHECK what they have written? You cannot always rely on your device’s spellchecker. I am something of a literary snob. Point taken. After 35 years of trying to teach children how to write correctly, it is firmly part of my makeup. It annoys me. I want to get out a red pen and draw a firm line through the offending words. Errors on signs in public places such as shops also irk me, as do mistakes in our local newspaper (which always has a few). I saw a classic example of this over the entrance to a restaurant in Kathmandu, Nepal. 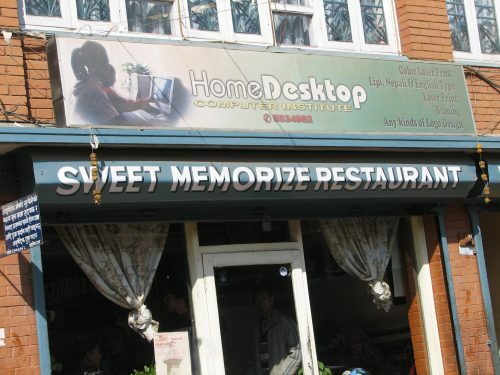 It was called “Sweet Memorize”. I certainly have memorised that sign, and memories of it are always sweet. I should add that I didn’t eat in that restaurant. Goodness knows what they did to their menu – especially if it was translated into English. I know it is petty of me to talk about this in disparaging terms. Providing there is communication, I guess that is all that counts. For publishers to allow errors of spelling in printed books is a totally different matter. I can accept the occasional typo, and even a small spelling mistake. But to allow a totally wrong word to be used is beyond comprehension. Someone in the proofreading department was asleep at the wheel, I think. I am starting to read more and more eBooks, and some of these have been self-published. This is where the errors are creeping in, and standards are dropping rapidly, often with amusing consequences. I was recently reading a wonderful novel which was spoiled for me by totally missed out words. It had a completely incorrect word. I concede that the words “obscurities” and “obscenities” are close enough to get the spelling incorrect, but surely someone picked up this glaring error before going to print? Whatever happened to allow this error to creep in is a lesson for us all. Proofreading one’s writing before it goes public is crucial, no matter what the format. Getting someone else to check your writing is also important. Now, before I post this article, I had better go back and check every word. I am always on the lookout for interesting articles about improving my writing and blogging. I am sure that I am not alone in this; we all want to improve our writing and develop more readers. In the last few weeks, I have managed to get back to more regular writing, including blogging here on this site and also several other sites which I manage or write for. I plan to write more posts more often in the coming months. I hope. Over the last few months, however, I have been a sporadic publisher of new articles here on this blog. I have also been unable to add much to my other sites as well (Trevor’s Birding and Trevor’s Travels). Sometimes life just gets in the way. I could give you a long list of reasons why this has happened, including illness, family responsibilities, involvement in various speaking engagements and so on. I won’t bore you with the details. Life happens. And sometimes, writing doesn’t. One of the best ways to increase the readership of your blog is to persist at your writing. If you are regularly adding new material to your blog, no matter what the topic or niche in which you write, your writing will attract more readers, Don’t be like me and only post every now and then! Like once every couple of months. By posting on a regular basis, you are more likely to develop not only new readers, but also loyal visitors to your site. Some bloggers are able to post a new piece of writing every day, and some are even able to post several times a day. I find that far too demanding, and most writers I know would be the same. Most of us simply do not have the time, nor do we have the material to write about. It is far better to set a realistic goal and persist at posting every three days, or once a week if that is all you can achieve. I mentioned above the importance of persistence. Success in blogging, it seems, is usually only achieved through long-term, consistent and persistent attention to the basics. One article I read recently was the transcript of a talk given by Darren Rowse of Problogger. You can read the transcript or listen to the 40-minute podcast here: 6 ordinary things can lead to extraordinary results with your blog. At the risk of stating spoilers here, his final point is persistence. Keep at it and you will be more successful than the vast majority of bloggers. The potential of blogging – this article is now over 10 years old and has not been updated. The figures in this article are all very outdated, but the principles behind it are still relevant. Besides, my predictions in this article have actually been realised over the last decade.